There are two parts to this lesson. The first involves introducing the students to the tools used in this type of artwork and having them form brush holders and small pots in clay. Later in the class they are instructed in the use of underglazes as a way of creating decorative patterns on their clay pieces. At the beginning of their next art class, they apply clear glaze over their fired pieces to prevent the inks from damaging their decorations. In the following class, the basic brush strokes for branches, bamboo leaves are demonstrated. After the students have practiced these strokes, they enjoy painting several compositions using these three brush strokes. In their final class, the students are shown brush strokes that allow them to create various animals, insects and flowers. Again, after a period of practice, the students are encouraged to use all the strokes to create more complex compositions. To introduce the students to a Chinese art form. To help the students be more aware of the quality of their own brush strokes and to give them an opportunity to improve their strokes. To integrate an art lesson with the activities going on in the classroom. There are two parts to this lesson. The first involves introducing the students to the tools used in this type of artwork and having them form brush holders and small pots in clay. Later in the class they are instructed in the use of underglazes as a way of creating decorative patterns on their clay pieces. At the beginning of their next art class, they apply clear glaze over their fired pieces to prevent the inks from damaging their decorations. In the following class, the basic brush strokes for branches, bamboo leaves are demonstrated. After the students have practiced these strokes, they enjoy painting several compositions using these three brush strokes. In their final class, the students are shown brush strokes that allow them to create various animals, insects and flowers. Again, after a period of practice, the students are encouraged to use all the strokes to create more complex compositions. Students will successfully form and decorate a clay ink pot and brush holder. Students will develop knowledge and skill in using underglazes. 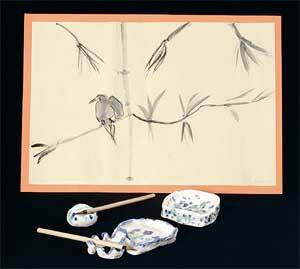 Students will demonstrate a knowledge of and skill with forming Chinese brush stroke techniques. Students will combine a variety of brush stroke techniques to create compositions.